With the capacity to produce different enzymes, macrofungi are able to efficiently degrade a wide rage of substances, so that, they are used as biodetoxification and bioremediation agents. For the ability to adapt in most variable and extreme conditions, different biomasses can be used as substrate for growth of macrofungi and obtention of by-products with great interest for industry. 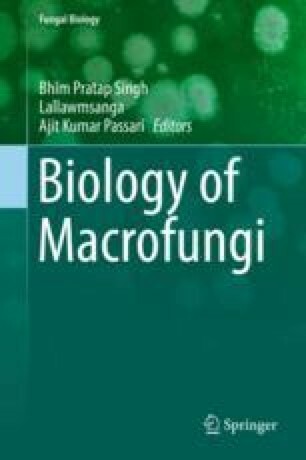 In this chapter, it will be further explored the efficiency and importance of wild mushroom as bioconversion and biotransformation agents of vegetal biomass, and the importance of these fungi as decomposers agent in the soil and finally explore the tools (omics) to understand the mechanism of the process. Macrofungi are vital agents for the maintenance of life on earth, meanly because of their capacity to biodegrade organic matter, such as all the components of wood. Purified enzymes from a macrofungus can be used for the production of new, valuable by-products from a specific substrate in a process called biotransformation. The fungi need to obtain energy from a nutrient source to create a new product. Complex substrates generally need to be degraded to produce sugars. This process is called biodegradation, which is applied to the disintegration of any matter by biological means. Biodegradation occurs through the action of specialized enzymes; some of these enzymes, called promiscuous enzymes, are able to degrade several analogous substrates. Through the action of these enzymes, the fungi are able to degrade/remove some toxic/xenobiotic substances by a process called biodetoxification. When the elimination of the xenobiotic compounds occurs in contaminated media, including water, soil and subsurface material, the fungus/microorganism performs a bioremediation or mycobioremediation. When the macrofungi are able to degrade complex organic matter into mineral samples, this process is called mineralization.